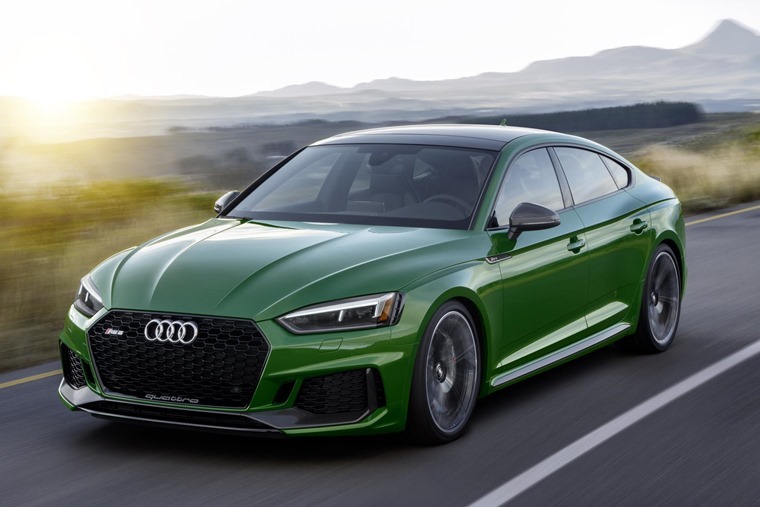 Audi brought a little extra bite to the Big Apple, unveiling the first ever five-door Sportback version of the mighty RS5 at the New York International Auto Show. With a V6 twin turbo 2.9 TFSI offering 450PS and 600 Nm of torque, the latest high performance, high tech addition to the Audi Sport stable will combine these impressive credentials with quattro all-wheel-drive, spacious five-seat accommodation and 480-litre luggage capacity. 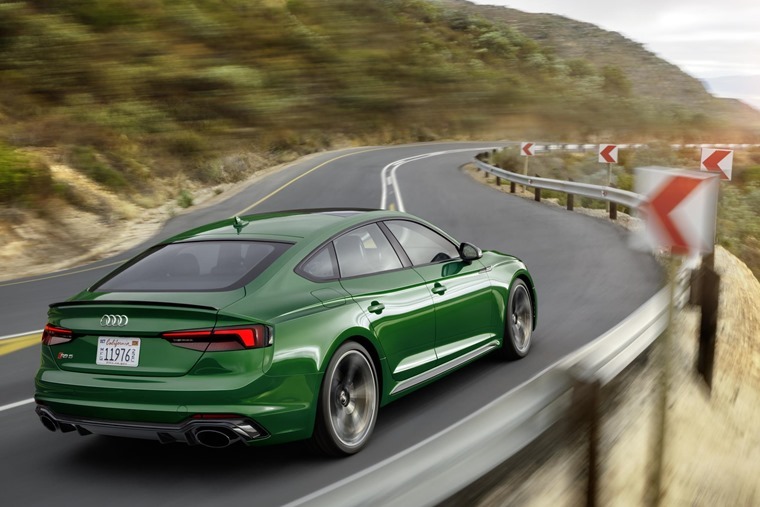 The exterior design of the new Audi RS5 Sportback is a blend of elegant curves and taut, athletic surfaces. The longer wheelbase, short overhangs and long, wraparound bonnet with power dome all help to signal intent, as do the characteristically powerful shoulder line and the quattro blisters in the flanks. At the front, the Audi RS5 Sportback features a wide, flat single-frame grille, solid air intakes with a honeycomb structure typical of an RS, and a front spoiler with matte aluminium quattro lettering. At the rear an RS-specific diffuser insert, RS exhaust system with oval tailpipes and fixed spoiler lip further distance the car from its A5 series siblings. With the aforementioned 450PS and 600 Nm of torque deployed throughout a wide speed range from 1,900 to 5,000 rpm, the new 2.9-litre V6 delivers slingshot performance that is reflected in a 3.9-second 0-62mph sprint time and the potential for a top speed of up to 174mph. Two turbochargers positioned centrally between the cylinder banks guarantee exceptional response throughout the rev range, with the output deftly managed by the eight-speed tiptronic transmission with optimised shift times. As an alternative to the standard set-up, Audi Sport also offers RS sport suspension with Dynamic Ride Control (DRC) featuring adjustable electronically controlled damping, along with features such as ceramic brakes and dynamic steering with RS-specific tuning. The centre differential-based quattro system has a 40:60 front-to-rear bias favouring agile, adjustable handling with optimal traction, and when tested by challenging conditions can channel up to 85% of power to the front and up to 70% rearwards. 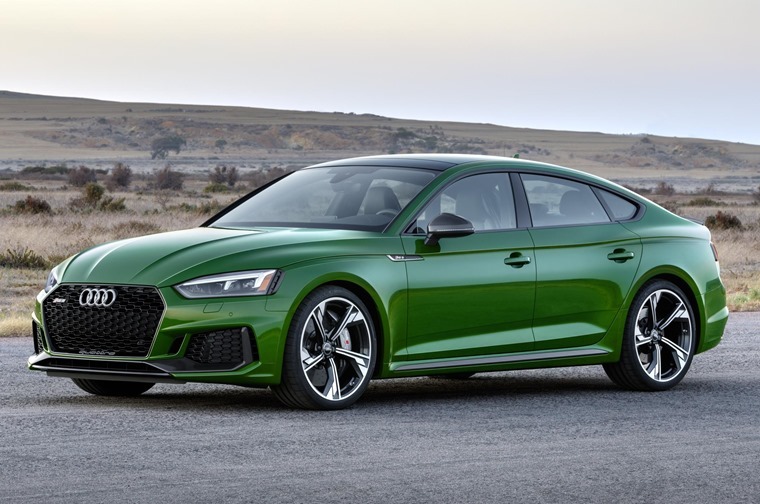 With that in mind, the above information is specific to the version of the Audi RS5 Sportback offered in the North American market. The model is expected to be available in Europe this summer.